Jewish Home MK and former Deputy Religious Affairs Minister laments split in religious Zionist vote, urges unity for days ahead. Religious Zionist voters took on too many responsibilities, and that led to Jewish Home's low seat count, candidate and Deputy Religious Affairs Minister Rabbi Eli Ben-Dahan stated Wednesday. 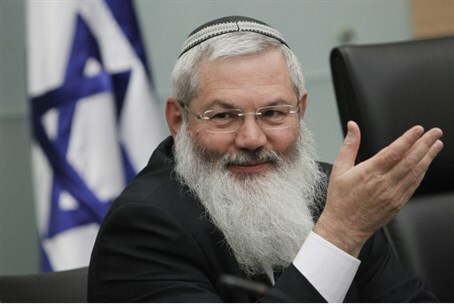 "Religious Zionist voters were told that Yachad-Ha'am Itanu would not exceed the threshold, so thousands of voters went to save it," Rabbi Ben-Dahan stated in a special Arutz Sheva interview. "It was also told that [Prime Minister Binyamin] Netanyahu might not prevail against [Yitzhak] Herzog and it wanted to give a boost to the Prime Minister." "The full extent of the responsibilities of Religious Zionism was revealed on the national scale," he stated, adding immediately, "I'm sorry it was at the expense of party loyalty." Rabbi Ben-Dahan noted that Jewish Home is relating completely differently toward Prime Minister Binyamin Netanyahu after the 20th Knesset elections - in sharp contrast to the 19th Knesset elections in 2013. "There is a different pattern here than during the previous elections," he said. "Netanyahu immediately called [Jewish Home chairman] Naftali Bennett, promising that he will be an important part of the next government. He recognizes the very great contribution of religious Zionism." Rabbi Ben-Dahan did not reject the possibility that Netanyahu had also turned to Labor, however, with a possibility of forming a unity government - although he added that the probability of such a union is low. Netanyahu understands that a right-wing government is a more natural vehicle to promote specific types of legislation, he said. "Remember also that this is what the people want," Rabbi Ben-Dahan added, "and the Prime Minister should recognize the will of the people of Israel." He predicted a coalition government with "all the religious factions, where issues of religion and state will be decided from a place of understanding and without arm-twisting." "A cohesive coalition is powerful, and if they [i.e. leftists - ed.] attack us in the Knesset, that's fine," he added. "This is all part of the parliamentary game that is the Knesset." As for the issues to be broached in the 20th Knesset, Rabbi Ben-Dahan predicted changes in the fields of law and media, which he noted require "change on a very large scale." When there are so many issues at stake, he said, there is no cohesive idea as of yet which specific conditions Jewish Home could set for joining a Netanyahu-led coalition - especially not this soon after the elections. Rabbi Ben-Dahan was also asked how Jewish Home could use lessons learned from the past Knesset and from this tumultuous elections season to succeed, without any backstabbing or blame accrued over issues that have arisen. In response, he cited the fact that Jewish Home is a Torah-based party. "The appropriate way to learn is to strengthen leadership, strengthen Bennett - who made enormous efforts and promoted a lot of areas in the past two years and marched his vision for religious Zionism forward extraordinarily," he said. "Beyond that we sit together and try to learn what we did not do well and fix that." The loss of seats was ultimately unexpected, he noted, and cited "various factors at play," including Netanyahu rallying support for Likud - and the Yachad-Ha'am Itanu party, which he stated was a split that was "not right and incorrect" for dividing the larger religious community, in his view, and damaged a united front on issues of religion and state. "Even if there were some mistakes and [voters] did not see the whole picture - the love of Torah and love of humanity that we brought to the table - I am sorry for this split and I hope that those who created it will also learn lessons and understand that the public is fed up with constant divisions," he said. "Woe to us that the Arabs were able to unite with all the hatred between them, and we as representatives of Torah are not able to come together," he added. "I hope that all of us can reunite and move forward, and establish the power base of religious Zionism and bring a blessing to the people."